Epilepsy is one of the most common brain disorders in the U.S. and is truly a difficult disorder to live with. University Health System’s Epilepsy Center (STCEC) is Central and South Texas’ only comprehensive epilepsy treatment center. Because they offer some of the most advanced diagnostic and treatment options, we needed to connect them with the audience that needs them the most. 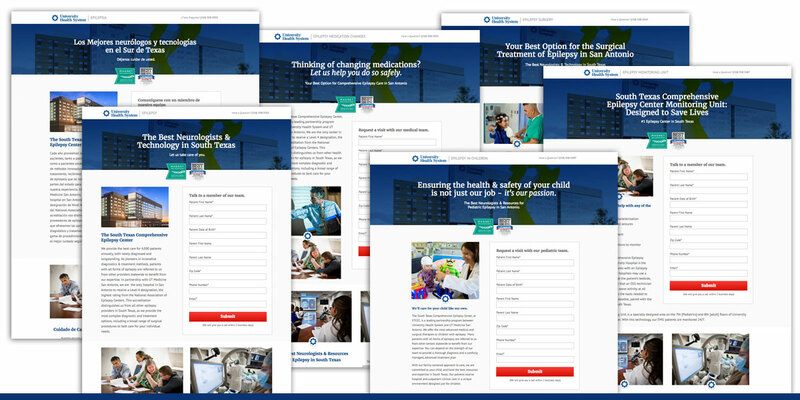 With six strategic landing page designs and a powerful Adwords campaign, UHS was able to target their audience and receive leads on new patients. 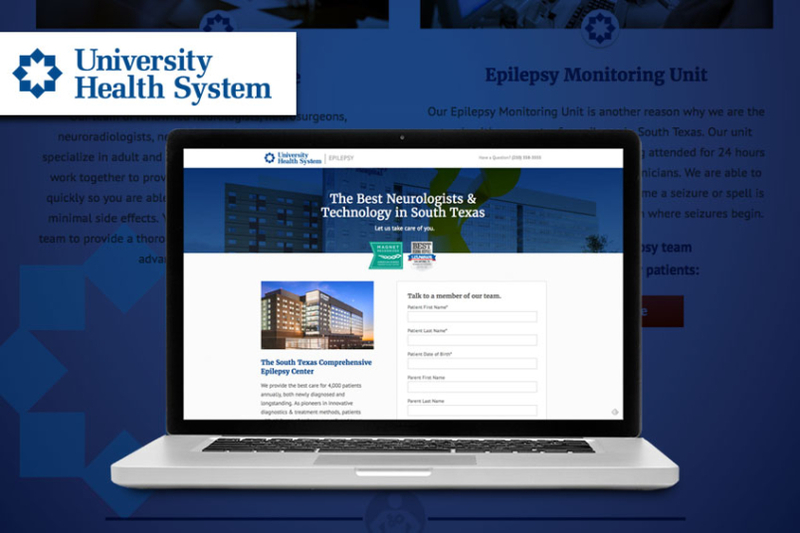 Our team worked closely with UHS and their world-class team of neurologists to craft relevant and informative content on five specific areas of epilepsy: medication, epilepsy in children, surgery, epilepsy in general, and their epilepsy monitoring unit. Once the content was polished, we created six landing pages to serve as a helpful resource to those looking for answers. Each landing page focuses on not only educating the visitor, but also pointing them to the next step in getting help. By simply filling out a form, they will be put into contact with the center to schedule an initial consultation to discuss their options. This is also a great way for our client to see how successful each campaign is doing. A custom, Adwords campaign was setup for each landing page using keywords relevant to each pages’ content. As with any campaign, we continually optimize the keywords and clean up what’s not bringing in the traffic to allow the campaign to improve month-to-month. Understanding the intricacies of Adwords also allows us to make adjustments that improve the overall ranking, and in turn, uses the campaign budget efficiently. Pair that with the conversion tracking we set up and every dollar will be utilized to its fullest! On launching the campaign, we noted a lifetime average position of 1.7 which isn’t a bad starting point at all. We saw larger numbers for the Diagnosis and Detection landing page since the keywords that were used were targeting general epilepsy searches to coincide with the content on the page. These searches also have a much higher volume so the numbers will naturally be larger. The Spanish Epilepsy page and Epilepsy in Children pages are searched much less frequently, so we kept that in mind when reviewing and comparing the numbers. While the large numbers may seem more impressive, we know that bigger is not always better. Many times, you’ll get more conversions on the very targeted campaigns because you’re finding a niche audience! Ultimately, for such a targeted campaign with highly focused content, these numbers are a great jumping off point for the campaign and will only continue to grow with further optimization! While numbers always excite us, the thought of connecting patients to a resource that can truly help them and their condition is a pretty gratifying feeling.